Every insect has a place in the world, but some are more of a nuisance to people than others. Flies fall into that category. The common house fly and stable fly are the primary pest fly species that create problems for people and animals, plus, these species are the most widely distributed throughout the country. Flies actually pay an important part in our eco-system. An adult fly lays eggs into rotting organic matter. The eggs develop into a larva (maggot), then pupate forming a cocoon. Inside the cocoon they metamorphose into an adult fly and the process is repeated. During the larval stage, the help decompose the organic matter. 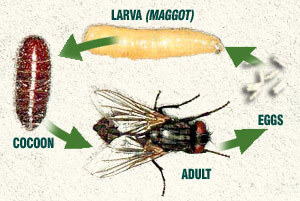 Adult flies are not only a nuisance to humans and animals, but they can also transmit some diseases. Female flies lay up to 900 eggs. Most of these eggs do not develop into adult flys because of natural predators and environmental factors. However, if any of these conditions change slightly (increased rain, manure, etc.) can greatly change the fly population in a very short time. House flys are 3/16" - 5/16" in length and black with 4 dark strips across its back (thorax). The abdomen is greyish or yellowish at the sides and has a dark strip down the middle. Its eyes are reddish and well separated in males. House flys have been associated with spreading over 30 bacterial and protozoan diseases. However, most house flys do not transmit these diseases with any degree of frequency, but the risk is always present. A female house fly lays about 150 eggs at one time and will lay between 4 and 6 batches in her lifetime. These eggs will hatch within 24 hours into tiny, creamy-white maggots. It takes about 2 weeks for a fly to go from the egg to adult stage, but under ideal conditions, this can be as few as 8 days. Male house flys live about 2 weeks and females up to 3.5 weeks. Adult flys feed on a wide range of organic materials and most adult flys stay within a close range of where they hatched, but they can travel up to 1/4 mile or farther. Biting stable flys strongly resemble the house fly except they have a needle like, stiff, piercing mouthpart that is folded below their head. Both sexes of stable flys feed on the blood of warm-blooded animals including humans. Female biting stable flys will lay 40-80 eggs at a time, and will have 10 - 12 batches in a lifetime. Under favorable conditions, the egg to adult life cycle is about 21 days, but can be as long as 78 days in unfavorable conditions or in cool climates. Stable flys over winter as larvae or pupae. Stable flys also can move great distances. Under favorable condtions (weather fronts) they can travel 100s of miles from their hatch sites. Overall sanitation is the most important and effective way to control excess fly populations. Use garbage cans with tight fitting lids and line inside with plastic bags to help reduce odors (which attracts flies). Occasionally rinse out garbage cans to remove food residues. Clean up after your pet regularly. Feces is a prime target for egg laying flys. Removing this from your lawn and landscape will reduce the opportunity for additional generations. Do this at least weekly. House flys take a minimum of 8 days to emerge, so weekly removal of all dog/cat feces from the property will greatly reduce your fly population. There are quite a few fly traps on the market that may be used for specific situations and specific fly species. Sticky fly traps have no attractant, but are usually placed near a window where flies will go to try and exit a porch or garage. A fly will land on the strip and becomes stuck. They contain no insecticide.